Welcome to your daily round-up of top science news. You can also get this briefing straight to your inbox: sign up here. 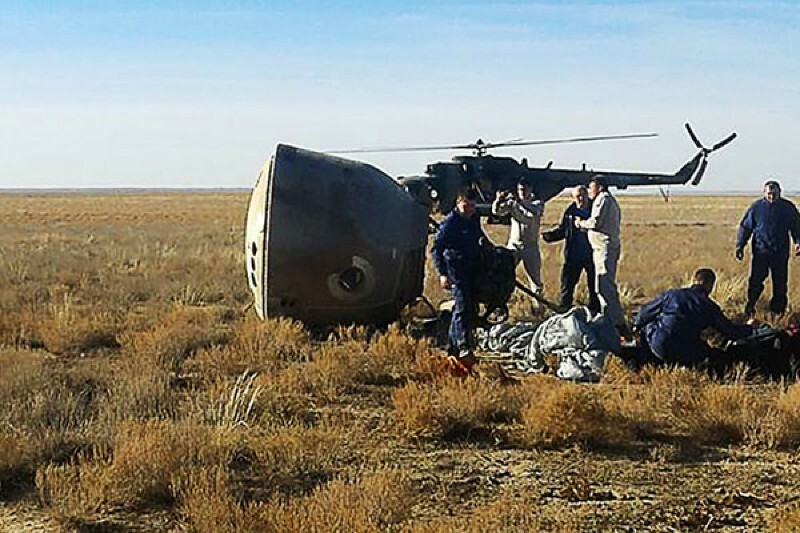 A Soyuz rocket carrying two people to the International Space Station (ISS) made an emergency landing today after a problem with its booster. NASA astronaut Nick Hague and Roscosmos cosmonaut Aleksey Ovchinin are safe and well after a bruising “ballistic reentry”. Russia is suspending crewed space launches, pending an investigation, which might affect how the ISS will be resupplied and recrewed in coming months. Amazon’s experimental programme to automate judging job applicants had to be thrown out after it adopted sexist hiring biases, reports Reuters. Machine learning based on past submissions effectively taught the system to penalize words that indicated the candidate was female. For example, the word “women’s”, as in “women’s chess club captain”, were downgraded. “I will have to practise not just saying the first thing that comes into my mind,” says physicist Donna Strickland about the platform that comes with winning the Nobel prize. Strickland tells Nature about how her research avoids exploding lasers, that she regrets not getting around to applying to become a full professor and why “this is a moment in history where women around the world aren’t letting much slide anymore”. Polygenic risk scores are diagnostic tests that add together the small — sometimes infinitesimal — contributions of tens to millions of spots on the genome. Powered by huge genomic databases such as the UK Biobank, these tests offer a promising path towards unravelling the heritability of many common conditions, including heart disease, diabetes and schizophrenia. But the approach is controversial. Risk scores can be hard for patients to understand. Scoring genes for things such as academic performance could be used to bolster social inequalities. And the databases themselves don’t tend to reflect the diversity of society. Cyber-policy specialist Alexander Klimburg reviews an illuminating, timely new book that draws together for the first time the public data about Russian involvement in the 2016 US presidential election. The book, says Klimburg , offers a clear analysis of what a modern information war looks like — and how complicit citizens and an unwitting media helped it along. A moon orbiting a planet could have a moon of its own. Astrophysicists Juna Kollmeier and Sean Raymond calculated that a “submoon” could survive in an orbit close enough that it wouldn’t be pulled away by larger celestial bodies, far enough that it would not be ripped to pieces by its host and at the perfect distance so that tidal forces would stay in balance. Both Earth’s Moon and Kepler-1625b-I (the first potential exomoon) could theoretically host such a moon-moon. But no such partnership has ever been spotted.